Rain was once again threatening and the race director was threatening back with letting us know if it rained we would be riding our mountain bikes on the road. Thankfully the rain did not come. The swim course was shortened but we were to now do 3 laps of this new course. While be assured that the distance would be correct, it was not…we swam approx 1300…it’s was suppose to be 800. Although I still did ok on this leg being one of the only people with a sleeveless wetsuit.Water temp was 62. Only one statement needs to be made about the bike, I did not do well. The run course was fairly fast, sadly I did not have anyone in front of me to try and catch. I ran alone until approx 1 mile from the finish I saw someone. I turned up the pace and passed them with about 1/4 mile to go. 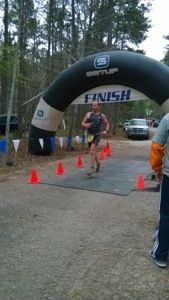 Final results were 2nd in my age group and 15th overall. Not a bad start to the season, but not great either. Looking forward to the next one.